Do you remember the series of “Beautiful Cookbooks”? I find myself flipping through the pages just to drool over the beautiful pictures, but I also find many recipes that I would love to try. I ran across this recipe in the “Southwest Beautiful Cookbook” and I was intrigued. The picture looked like a margarita in a jar and I wondered if it would taste as good as I imagined. 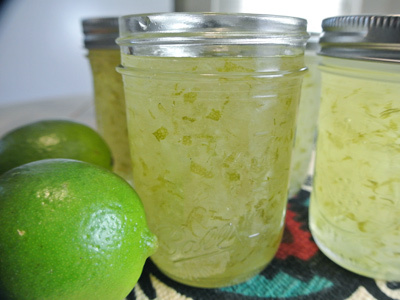 As it turned out it was a sinfully sweet version of a classic margarita that I could spread on a cracker, biscuit or muffin. 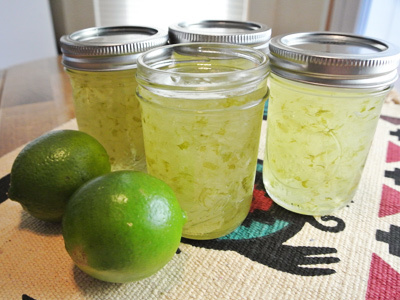 You’ll need some Tequila, Triple Sec, sugar, liquid pectin, lime juice and zest. 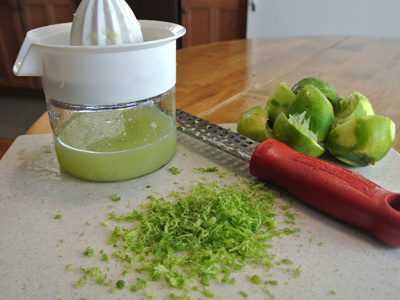 Juice enough limes to make 2/3 cup and zest 2 limes. 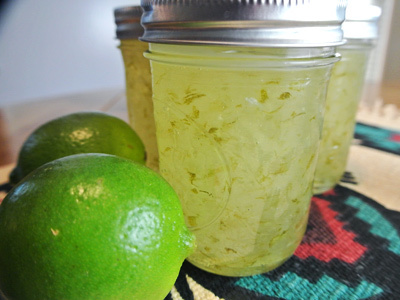 In a heavy saucepan, stir together the 2/3 cup Tequila, 1/3 cup Triple Sec, 2/3 cup lime juice, 3 cups sugar, and lime zest. Bring to a boil over medium heat stirring until the sugar is dissolved. 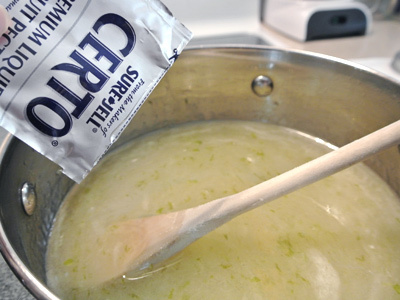 Once the sugar is dissolved, stir in 1 packet (or 3 ounces) of liquid pectin for 1 minute. 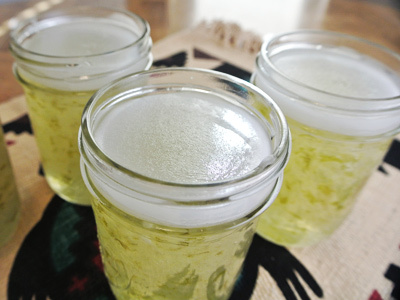 Pour into 4 sterilized 1/2 pint jars. 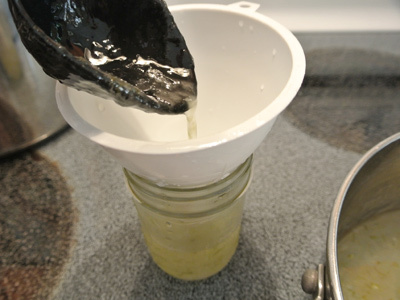 To sterilize jars, place jars and lids in boiling water. I wanted to set my jam in the pantry so I am going to seal the top with paraffin wax. Melt 1 wax cube over medium heat in an old cooking pan. When melted, spoon about 1/8 inch over the top to seal in the jam. Once the wax has cooled and turned white, spoon another 1/8 inch. Let the wax completely cool before sealing the lid on. The jam should keep in the pantry for 2 month’s. I sealed 3 jars with paraffin wax for the pantry and 1 jar will go in the fridge. 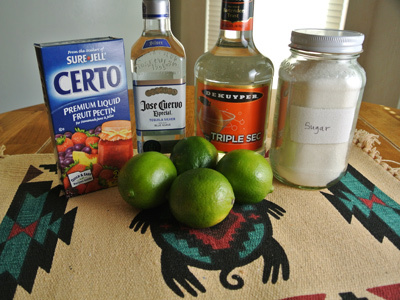 In a heavy saucepan, stir together the Tequila, Triple Sec, lime juice, zest and sugar. 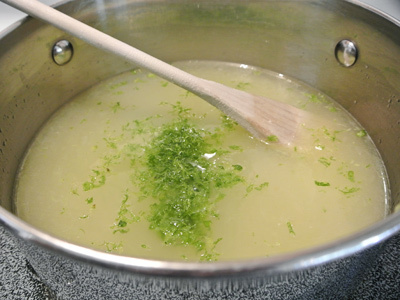 Bring to a boil over medium heat, stirring until the sugar dissolves. Add the pectin and stir for 1 minute. Ladle into hot sterilized jars and seal. 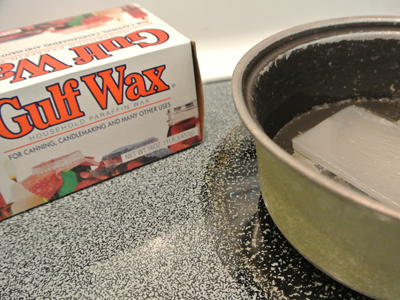 If sealing with paraffin wax, melt wax into a small saucepan and spoon 1/8 inch over the top of jam. When cooled, spoon an additional 1/8 inch. Let cool, then secure with lid and seal. Will keep for 2 month’s in pantry or you may refrigerate for immediate use. How long will this keep in the fridge? Can’t wait to try… sounds yummy! Hi, you can refrigerate it with a lid for up to 2 month’s as well.